Michael: (explaining ideas to his associates in a meeting) ...And we're back on track, and we're focused, and ... Buster. 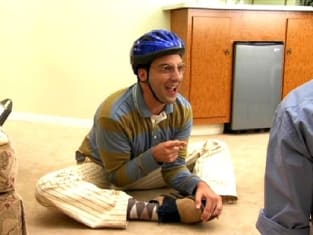 (who is assembling the bike) You can't do that in the snack room, pal? Buster: Mom told me to stay away from microwaves. And besides, this is gonna be the most bitching fast bike in all of Orange County! Arrested Development Season 1 Episode 3: "Bringing Up Buster"
Lindsay: You're still not an actor. Michael: Be careful. Are you okay? Tobias: (whimpers and grimaces for a few seconds) Hot hot...Now, take my daughter for example. She lives her life, and I get the pleasure of guessing what that mind entailed on. Watch this. Maeby, where are you off to in this glorious Sunday afternoon? (whispers to Michael) She won't tell you. Maeby: I'm going to audition for a play. Tobias: Well, that time it didn't work...What?! What play? Maeby: It's for high school. You can't audition. Tobias: I was totally wrong! She's reaching out to her actor daddy. DOES ANYONE HAVE AN ICE PACK? !